KKR chased down RCB's target of 177 with 7 balls to spare. 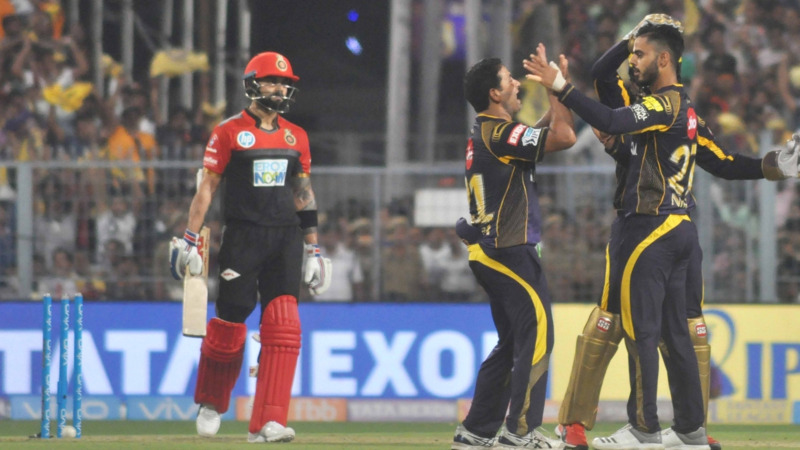 Amidst plenty of buzz, Kolkata Knight Riders faced the star-studded Royal Challengers Bangalore side in the third match of the ongoing Indian Premier League (IPL) at the iconic Eden Gardens on Sunday (April 8). Under the newly appointed captain Dinesh Karthik, KKR started their campaign in a grand style as they defeated RCB by 4 wickets. After winning the toss, KKR opted to bowl first and restricted the rather mighty batting line-up of Bangalore to a total of 176/7 in 20 overs. After a blazing start from Brendon McCullum (43 runs off 27 balls) followed by a rapid 64 runs partnership between skipper Virat Kohli and batting maverick AB de Villiers, RCB were looking all set for a 200+ total on the board. However, part-time spinner Nitish Rana had a different plan in mind as he removed both the RCB stalwarts in successive deliveries. Besides Rana, Vinay Kumar chipped in with a couple of wickets while Sunil Narine, Mitchell Johnson and Piyush Chawla claimed one wicket each. In reply, KKR suffered a big blow upfront as Chris Woakes removed the swashbuckling opener Chris Lynn for just 5. Lynn’s opening partner Sunil Narine though was in his zone and he punished the RCB bowlers to all parts of the ground to notch up his second IPL fifty in just 19 balls. After Narine’s dismissal, KKR lost their experienced campaigner Robin Uthappa for only 13, but young Nitish Rana and skipper Dinesh Karthik’s 54-run stand for the fourth wicket almost sealed the deal. Rana got out for 34 in the 15th over, but Karthik (35 off 29 balls) remained unbeaten to see his side home with 7 balls to spare. Chris Woakes and Umesh Yadav were the pick of the bowlers for RCB as the pace duo claimed 3/36 and 2/27 in their 4 overs respectively. So the two new captain entrants from TN got the better of the Delhi Boys in the #IPL today. Couldn't have asked for a better start to their captaincy stints.